Ambition can be deadly in pop music – think prog rock, Tommy on Broadway, and, more recently, outsize double-CD sets from rappers making bids for self-canonization. But well into the post-punk era of lowered expectations, at a time when serious artists like Pavement are content to make modest statements within their own genres, a little overreaching can be a good thing. The French duo Air cite the expansive soundscapes of the Brian Wilson-produced Pet Sounds as an inspiration for the undulating grooves of their first album, Moon Safari. But they also took their kitschy space-age pop with deadening seriousness, giving the album plenty of ironic distance but little in the way of emotional resonance. Still, Air’s nods to Serge Gainsbourg, Burt Bacharach, and elevator music hinted at great things to come, and they fulfill that promise on the soundtrack to Sofia Coppola’s The Virgin Suicides (Astralwerks/Virgin), trading in their Moogs and Mellotrons for drums and guitars without losing their plastic-fantastic vibe. The chiming synths and guitar sprawl of “Bathroom Girl” sound like a gospelized Ziggy Stardust; the high-pitched chants of “Cemetery Party” are almost seraphic; and the plaintive acoustic guitar and bluesy piano on “Highschool Lover (Theme From The Virgin Suicides)” matches the quiet power of Aimee Mann’s music for Magnolia. Femi Kuti came into his ambition the old-fashioned way: He inherited it. His father, the late Nigerian saxophonist and bandleader Fela Anikulapo-Kuti, created Afro pop by blending free-form jazz, traditional Yoruba music, and the funk of James Brown, but he railed against his son’s saxophone playing before eventually accepting him. The two had ideological differences (Femi shares his father’s political activism but is more diplomatic toward the Nigerian government) as well as musical ones, but unlike the second generation Marleys, Femi takes purposeful steps out of his father’s shadow. Fela’s songs evolved as jazzy jam sessions best appreciated with repeated listenings, but Femi’s debut album, Shoki Shoki (MCA), leans toward rollicking, horn-driven funk with manic polyrhythms aimed directly at the dance floor. Only occasionally does Femi fall into his own formula – several of his songs begin with an exuberant “A-ha!” followed by chicken-scratch guitar playing and big horn bursts from his band. 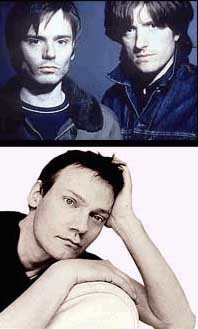 electronic-music producer William Orbit didn’t inherit genius genes, but no one can fault his lineage: His amniotic sonic backdrop lent some depth to Ricky Martin’s duet with Madonna, “Be Careful (Cuidado con Mi Corazon)” and he gave Madonna’s Ray of Light enough thumping house grooves and trippy trance beats to make her New Age self-righteousness bearable. He also made moody, ambient music in the eighties under the names Bass-O-Matic and Strange Cargo, but his Pieces in a Modern Style (Maverick) is a riskier move: The album is devoted to faithful synthesizer interpretations of classical-music compositions from the likes of Handel, Beethoven, and Ravel. It’s intermittently successful, as on the washing tones on Ravel’s “Pavane Pour une Infante Défunte,” the sprightly keyboard playing on Vivaldi’s “L’Inverno,” the moody synth notes that stand in for the titular strings on Samuel Barber’s Adagio for Strings. Unfortunately, classical music has been a dubious trope in electronic work since Switched-On Bach, and Pieces has a preciousness that can be off-putting. Orbit doesn’t help matters by sticking to well-known compositions – such as Barber’s Adagio, also familiar as the theme to Oliver Stone’s Platoon – over more obscure ones he might be able to put a distinctive mark on. Too often, his faithfulness turns into meticulousness, resulting in an album that’s as formally impressive but as snooze-inducingly detailed as a special-effects-addled blockbuster. Like Kruder & Dorfmeister, an Austrian production duo who make the kind of austere electronic music that’s become the soundtrack to boutique shopping in SoHo, Orbit aims for high culture and just ends up low on pop pleasures. At their best, Air, Kuti, and Orbit represent pop music’s creative frontier, a place where genres collide into one another and orthodoxies are cast aside. But as a previous generation of ambitious conceptualists proved in the seventies, pop sometimes works best when ideas are rationed sparingly.